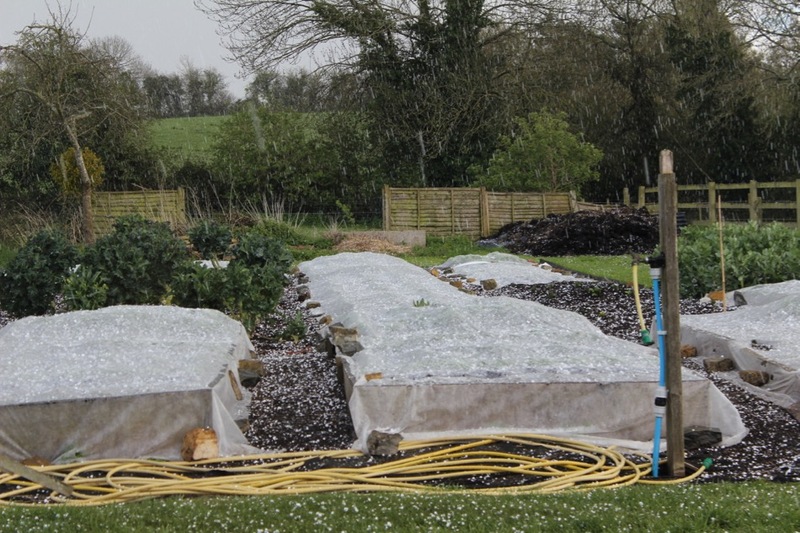 Frost and hail in late April were a timely reminder to wait before sowing and planting warmth-loving plants. In this area (SW England) its good to sow runner and French beans mid month, undercover, for planting in late May or early June. 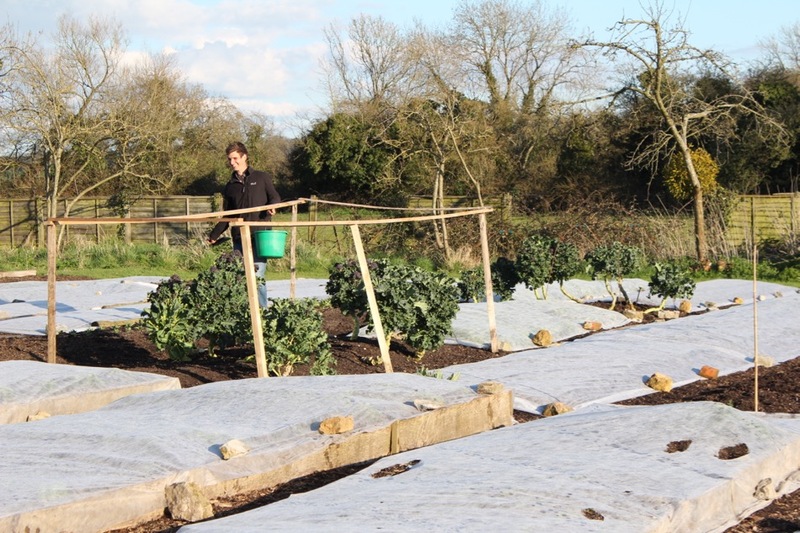 Even then the wind can be cold and after planting and often I cover young bean plants with fleece (celeriac too unless its hot), which is why I prefer not to put up bean sticks until plants are growing strongly. 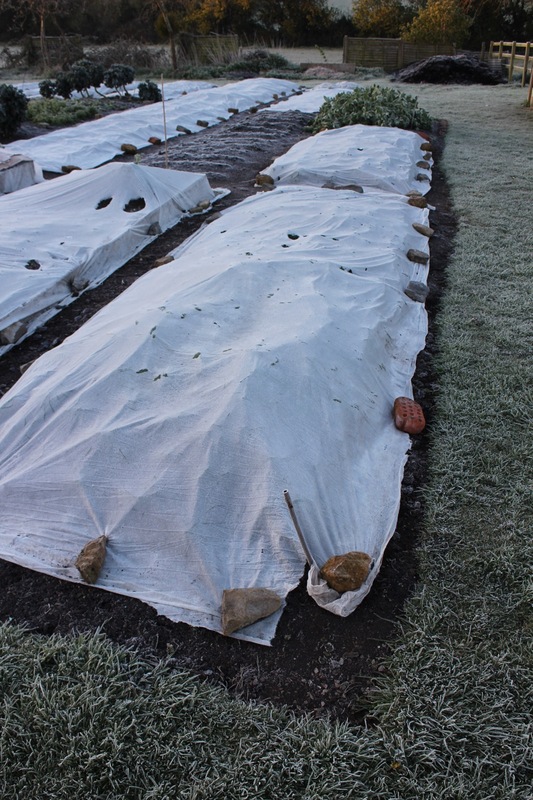 Fleece covers have been absolutely fantastic at sheltering seedlings from the cold winds. 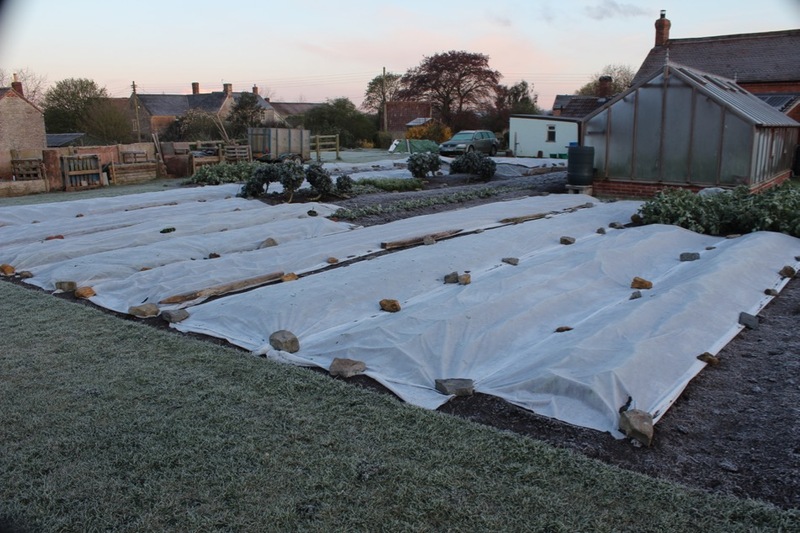 However my method of laying fleece directly on top of seedlings means that frost sometimes singes leaves where they are touching the cover. 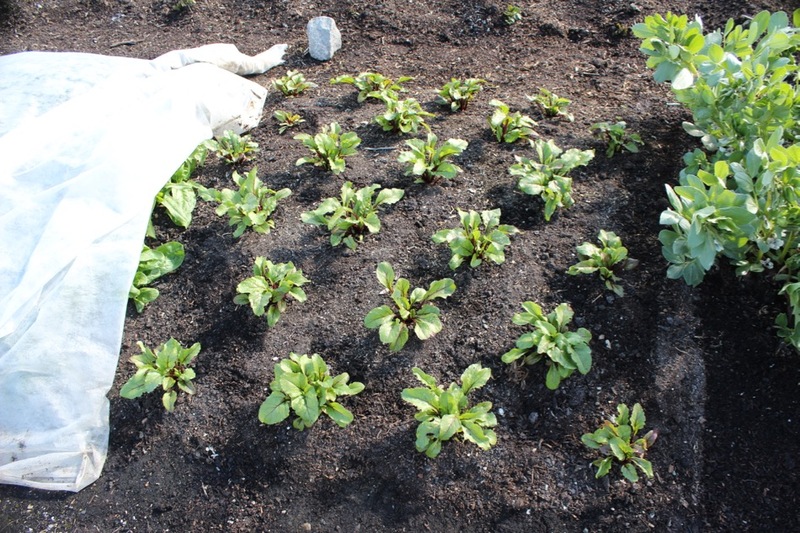 That small issue is more than offset by the general gain in heat from having fleece so close to the plants, so that it can hold more warmth where it is most needed, in the soil surface and close to plant leaves. Many of my fleece covers are coming off this coming week, some to be replaced by netting and mesh if the crops are susceptible to birds or rabbits. The weather, how much does it change timings? In spring, sowings tend to catch up, so delays that feel bad at sowing time feel less bad after a few weeks! Be patient. 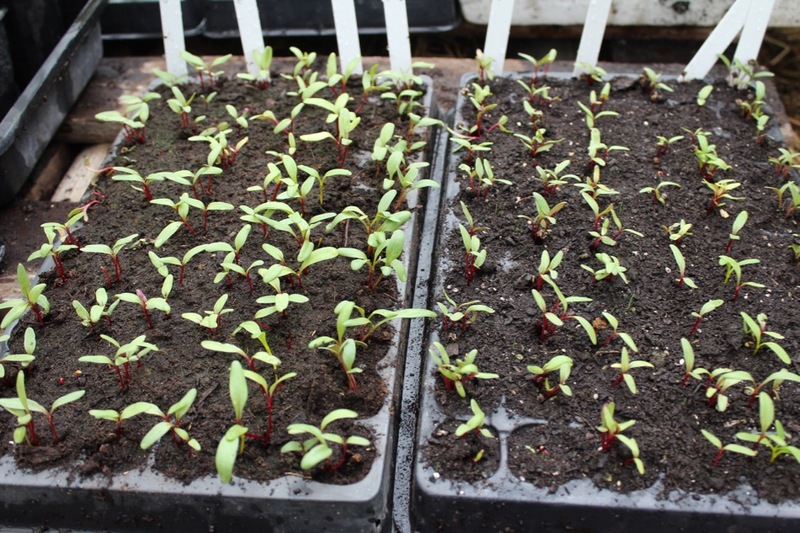 Seasonal sowings work because plants sown at their best time are able to cope with unusual weather, so check my sowings timeline. 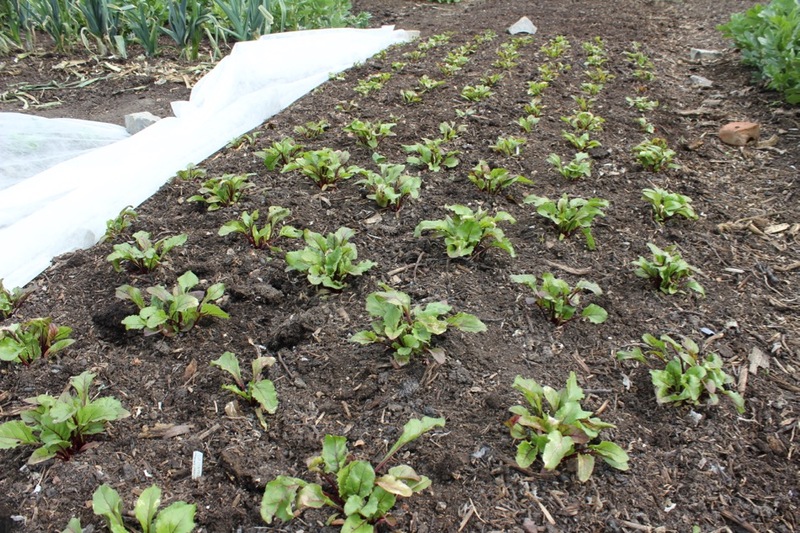 For example the spinach I sowed on February 11th, planted March 14th and grown throughout under fleece, has suffered many frosts. But it survives frost and is programmed to make masses of large leaves in cool weather, when days are lengthening fast. We picked it for the first time, just three hours after a frost of -3C, to have 3kg of lovely leaves from an area of 4x5ft (1.2×1.5m). And that is just the first pick, it will continue cropping until flowering after mid June. 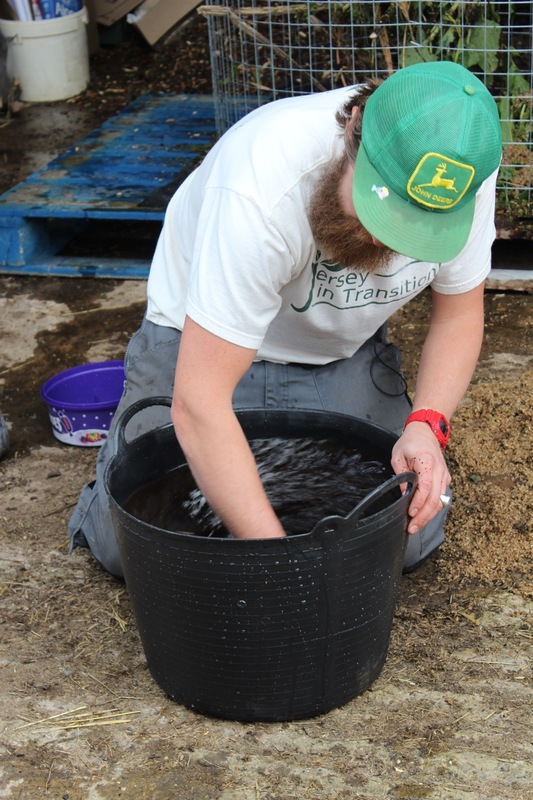 Even in May they are useful, so we just topped up the greenhouse hotbed with a large wheelbarrow of fresh horse manure and the temperature has maintained at 60C 140F, one foot in. 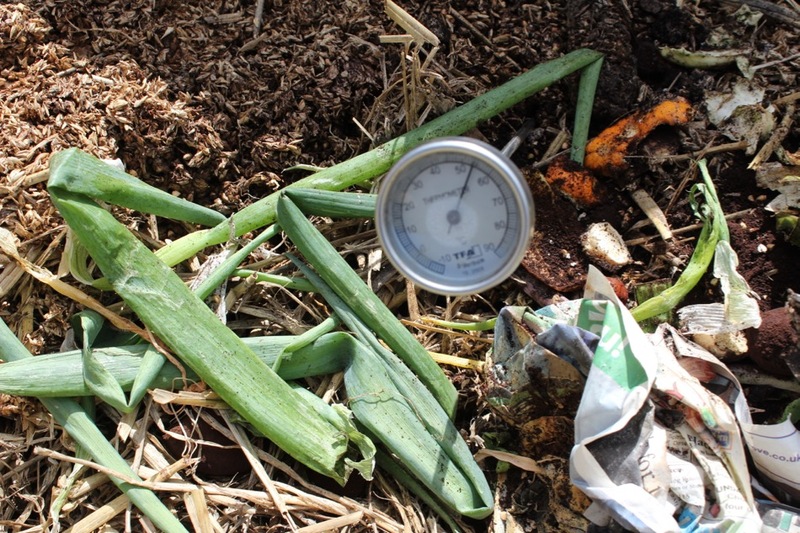 The outdoor hotbed is simply a recently made compost heap, see below, and its temperature one foot in is a steady 50C. This has kept frost off the plants sitting on a wooden frame above it, but there is a lot of steam around their leaves so this would not suit basil, for example. 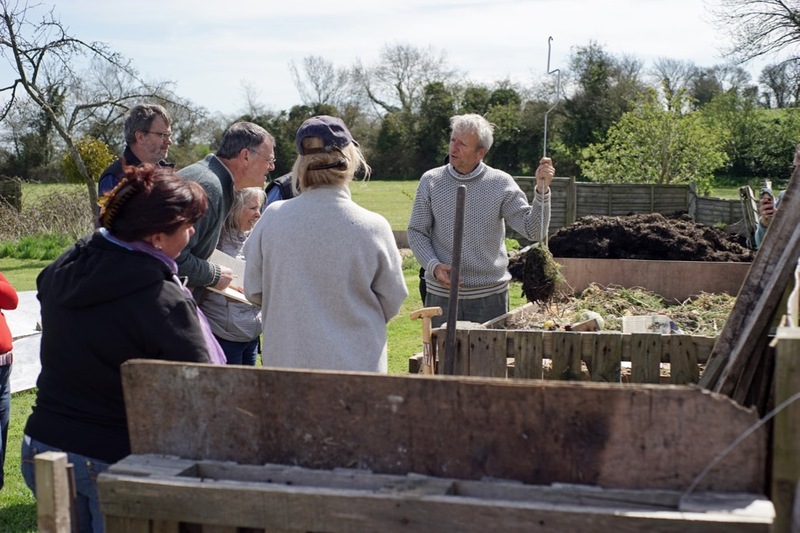 On course days here, I have always noticed the high level of interest in compost making. 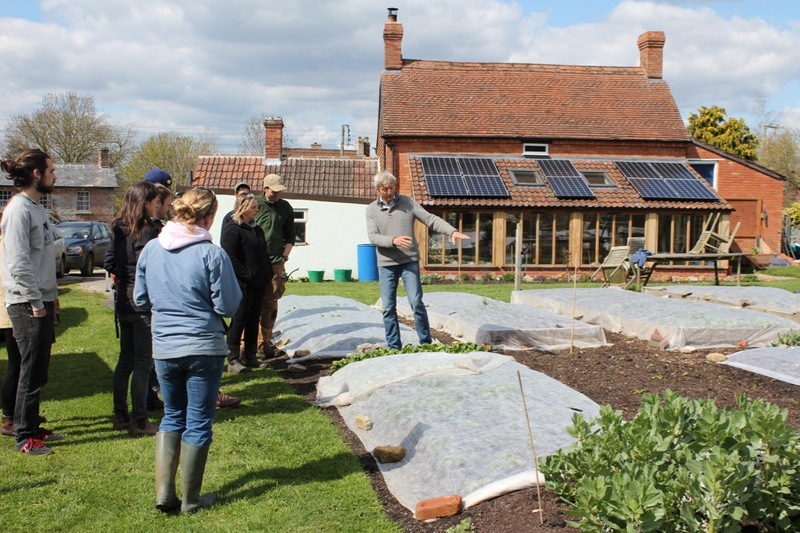 Like many growers and gardeners, I find it hard to put enough time into looking after my heaps, so I went on a course with Zach Wright to learn more (organised by RegenAgUK). 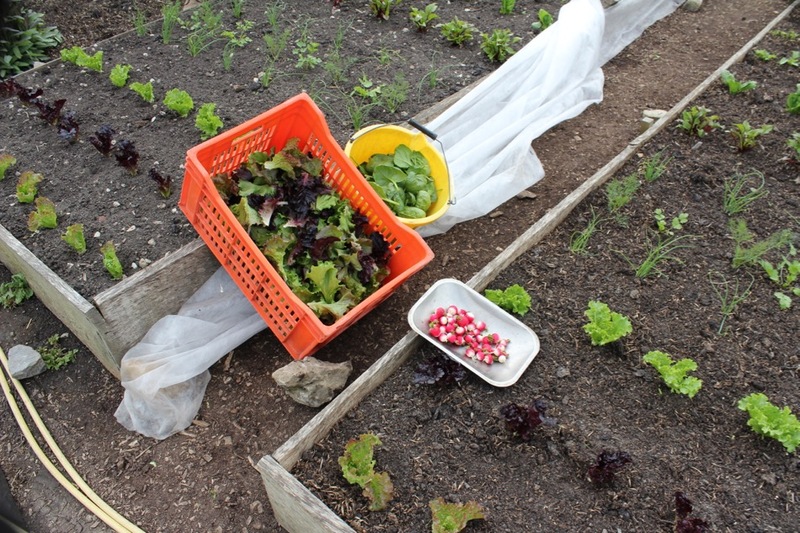 Meanwhile, Steph and Felix looked after the salad picking. 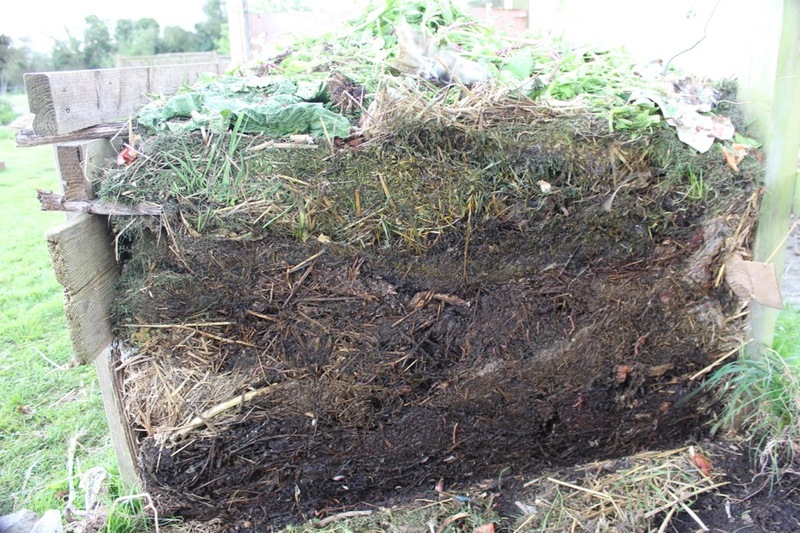 One really good heap can serve as a fund of healthy organisms to make both extract and tea. The former is from stirring 15 minutes with vortices in both directions, the latter is a 24 hour brew needing a pump to aerate the brew. This is about making the highest quality you can, using whatever is available nearby. As I understand it, Zach recommends 40% brown, 40% green and 15% ‘activator’ of high nitrogen, such as brewers waste (barley mash) or fresh manure. The other 5% can be old compost, soil, old manure, and we added some rockdust. Best results are from assembling in one day. 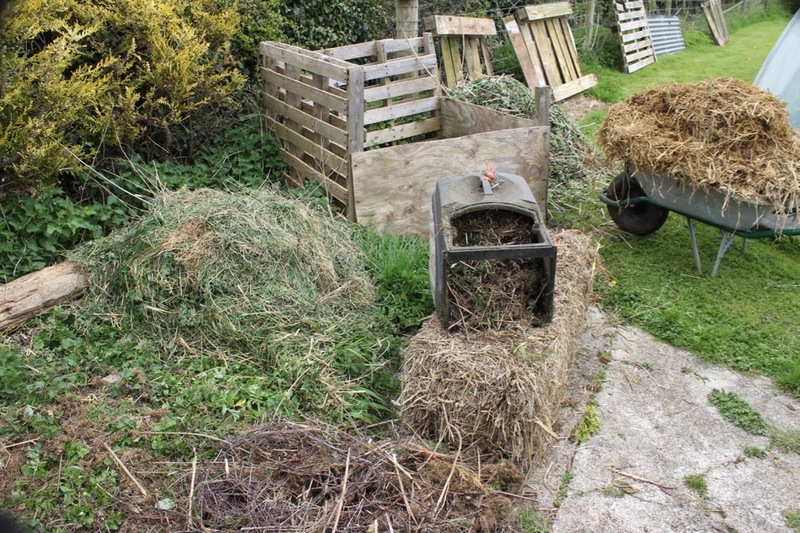 Brown: my neighbour has some old straw which is too damp for the horses, and we found some woody garden waste thrown over the fence by a neighbour. I ran the rotary lawnmower over this to chop it smaller, lengths of no more than 4in (10cm). Activator: we fetched two barrowloads of fresh horse manure from Jenny up the road, and this helped to stimulate a rapid heating. Also we added two buckets of rockdust while assembling. I had bought a tonne so there is plenty, otherwise a few handfuls would be good. 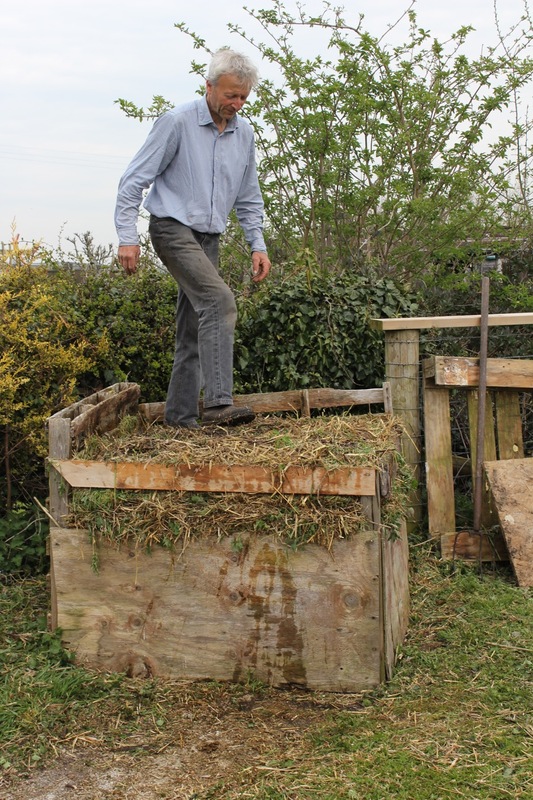 Water is often needed and we put on about 160 litres or 35 gallons while building the heap. The straw parts were soaking up a lot. update June 8th: this heap turned out too wet and with the benefit of hindsight, I would not have added any water at all. We have found that grass mowings in particular hold so much water that they provide enough moisture, during the decay process, to other dry ingredients (see also the mod May and June posts). I have been much helped by an extra pair of hands and Felix turned the winter compost heap as soon as its last additions had gone on. First addition was in December, of asparagus stalks. Since turning the temperature is ready 60C or more in a large area of the middle. 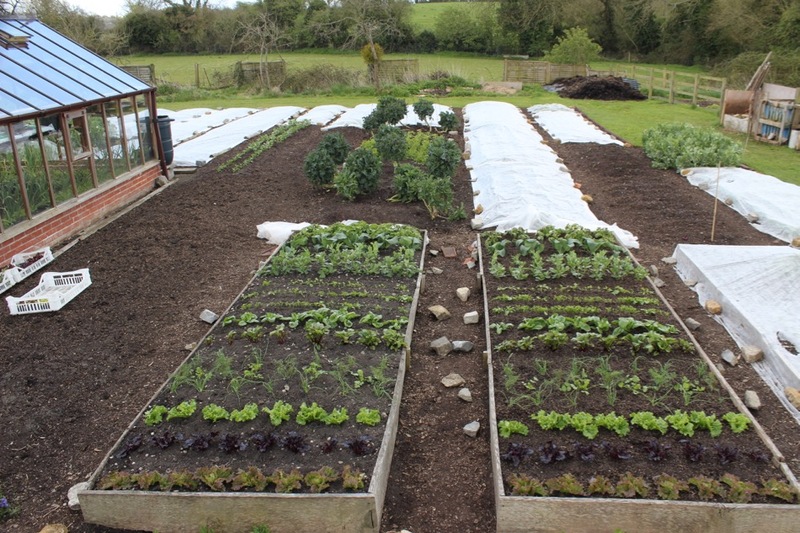 Thanks to Peter McGuire from Shepton Mallet, who ordered some Klasmann seed and module compost, we have been able to do a little trial, comparing chard, basil and leeks sown into it, compared to my normal West Riding. 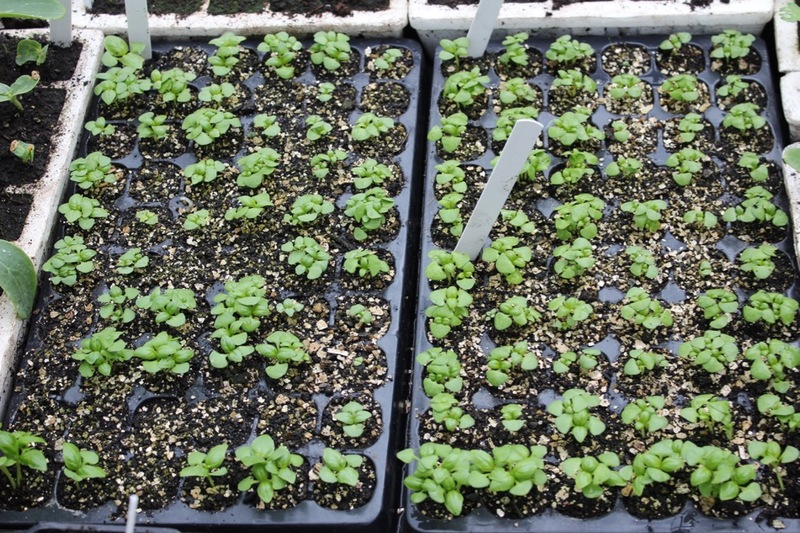 Seedlings are growing a little larger in the Klasmann and germination has been excellent, for example of basil, which struggles with the rich density of West Riding. It works well when diluted with 50% vermiculite, just for sowing. Incidentally the Klasmann worked out at £8 for 70l, compared to £6 for 40l of West Riding. But its based on peat. 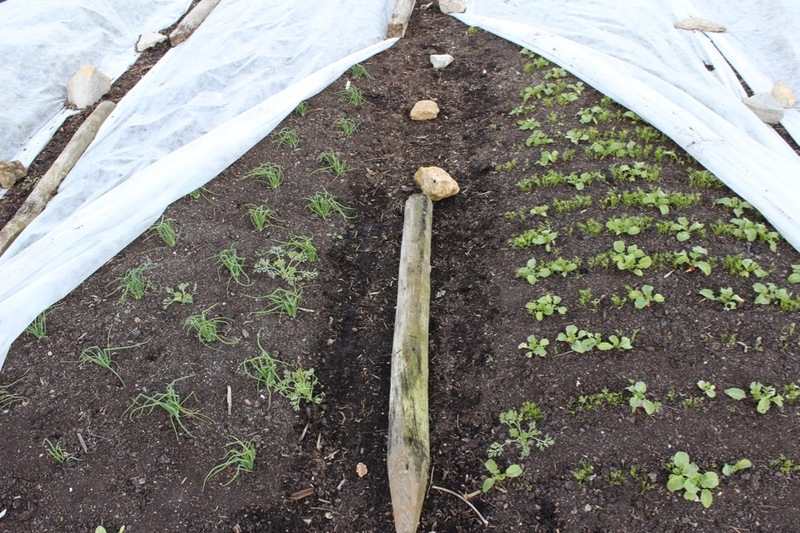 Onion leaves are fragile and yet I am finding they can do well with fleece laid on top, as in the photos below. This week I plan to remove these fleeces and shall need to cover plants with netting suspended by hoops, to keep rabbits at bay. This spring I have found fleece extremely useful as weather and pest protection. I am not certified biodynamic but apply the wisdom where appropriate. I think that stirring water in vortices, and breaking them to make ones in the counter sense, is a brilliant way to energise water and from it the soil. Viktor Schauberger told of a farmer in Austria who did that before biodynamics was even invented: instead of a bd preparation, he energised the rotating water by singing! Here I buy some horn manure preparation and we apply it in spring and autumn. 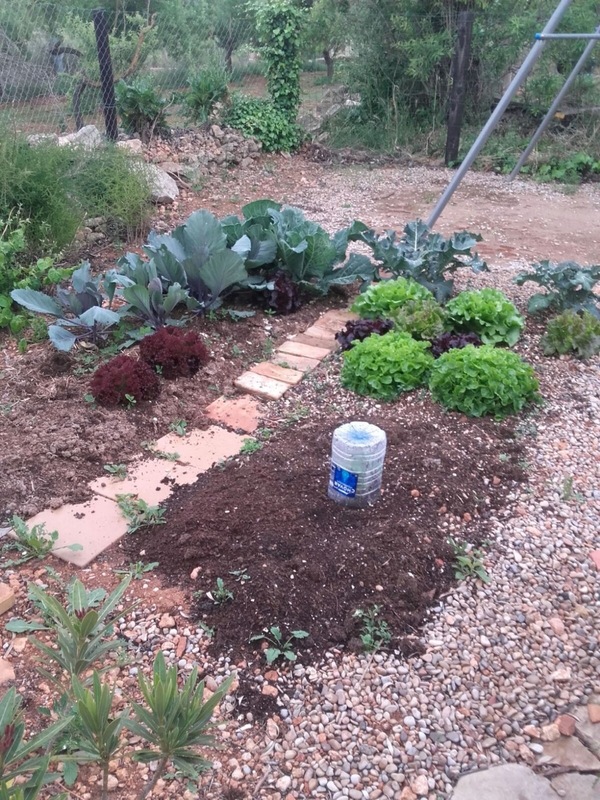 Hector from near Villarreal in Spain has created a no dig garden and he writes “My experimental organic garden here in Spain is working very good. I am very surprised about the result”. He is highly trained (hence perhaps the surprise!) and currently works on a huge vegetable farm in southern Spain. 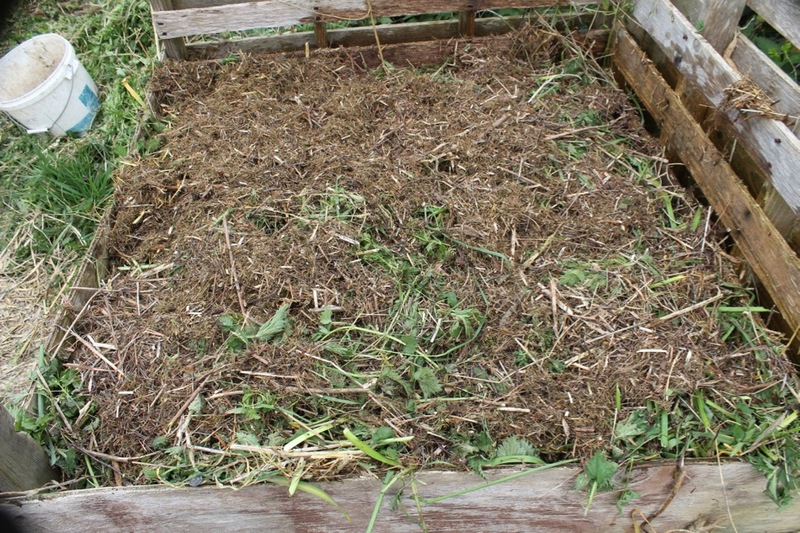 My garden compost looks good but produces loads of seedlings (tomato and more) on previously clear veg beds – any suggestions?! 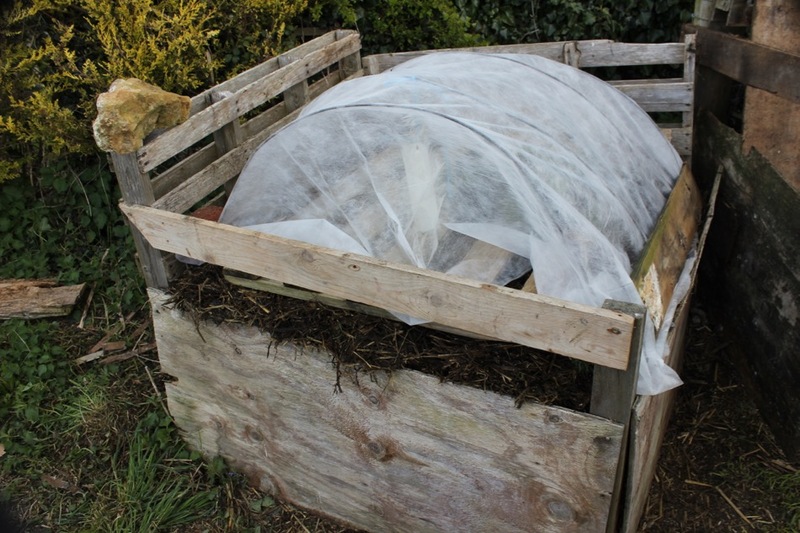 Need to get the compost heap hotter? Would making compost tea be a way round this? 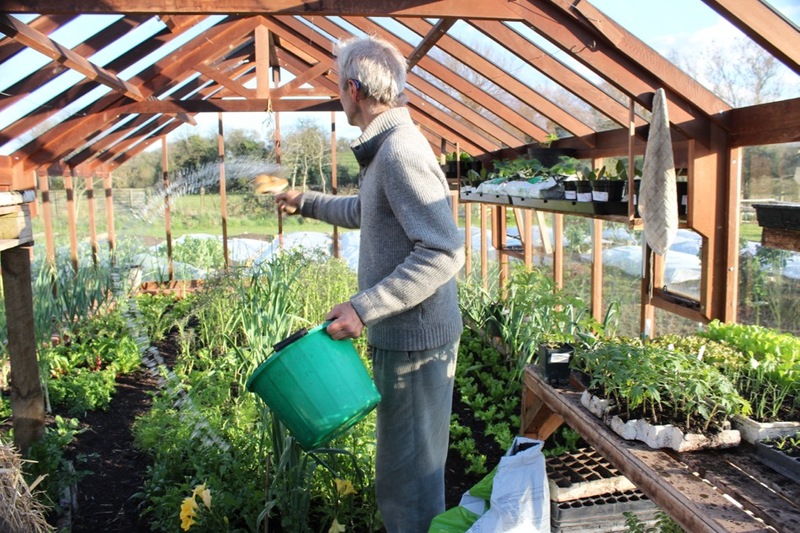 Getting it hotter would certainly help but if not just keep hoeing the tomatoes as you would any other weed that pops up – it won’t take long to stop them. Yes PJ, Simon’s point is good and hoeing compost, even lightly raking the top inch, when weeds are tiny is a great way to achieve a clean surface. And worth it for the longer term mulching effect. 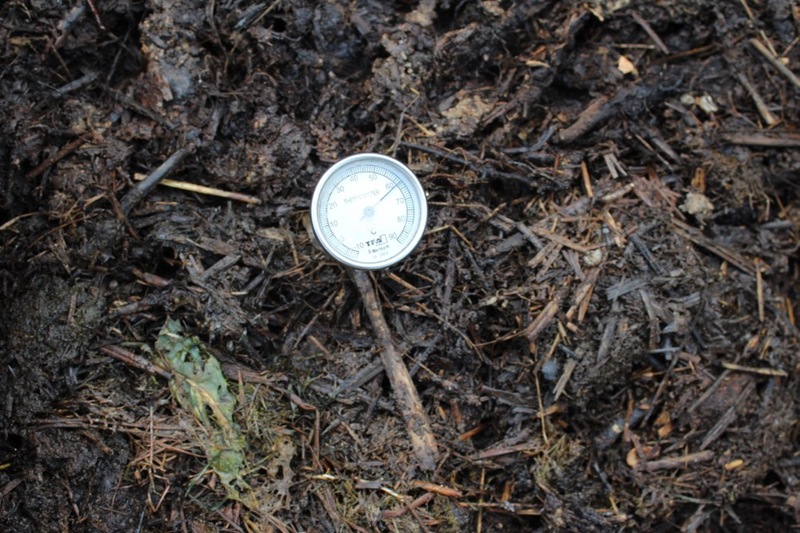 Getting compost hot is difficult in winter months so often one has to accept weed seeds. One interesting thing I’ve noticed with radish under fleece this spring is that those sown in modules and planted out tend to be longer and thinner, whereas those sown direct (between parsnip rows) have come out slightly shorter roots, but considerably more rotund. I don’t know if any of your radish eaters are fussy, but it does appear that you can design your shape of French Breakfast radish roots according to how you sow them! Interesting! I am growing a round variety and have not noticed this. The flavour is currently mild after their growing on cool conditions and I like that, for me they are right is season now. I agree – the radish harvest this spring is proving excellent and tasty. We are harvesting a round dozen a day and shall certainly be doing so for at least another 10 days. Then we shall see what Sicilian Radishes bring us in the second half of the month…. I bought your book: Veg Journal last spring. One of the best bits of advice was to always keep on top of weeding. 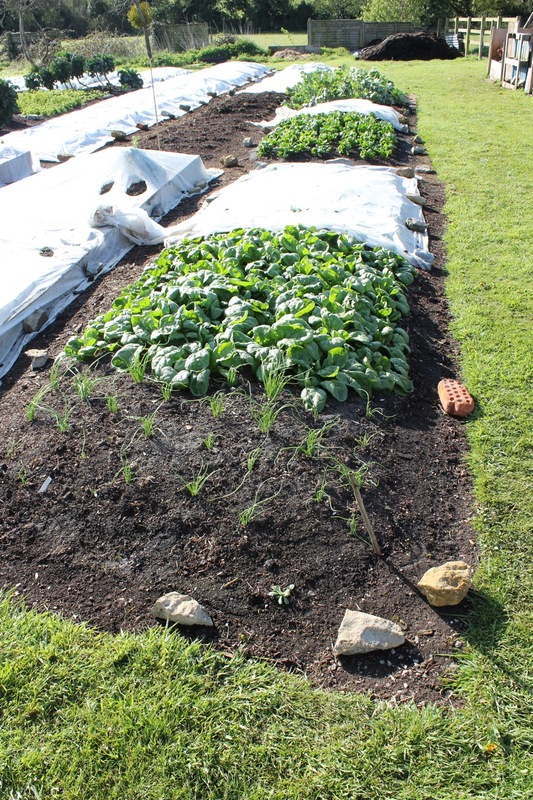 By doing a bit throughout winter when I went to the allotment to pick veg, my plot looks pretty clean, whilst those of ‘summer only allotmenteers’ are back looking like a field! And my dodgy back appreciates the no-dig growing! 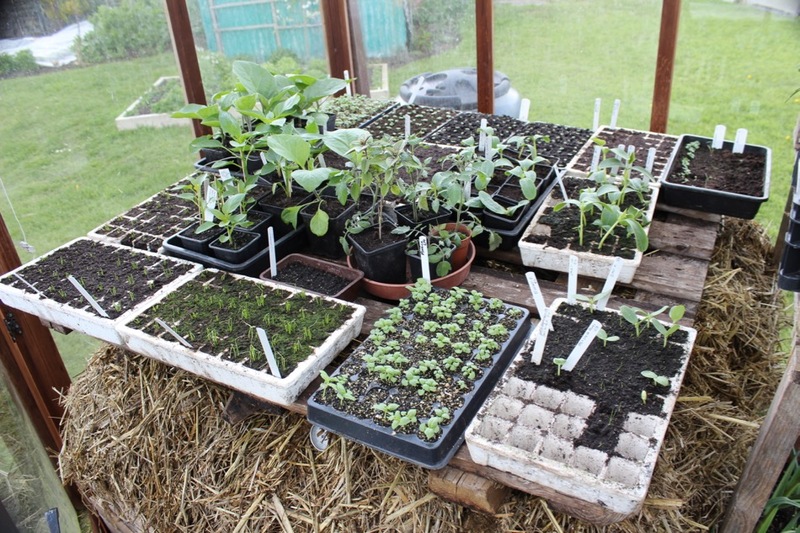 Hello Alice, this is lovely to hear and well done on staying weed free, now you can enjoy easier sowing and planting! 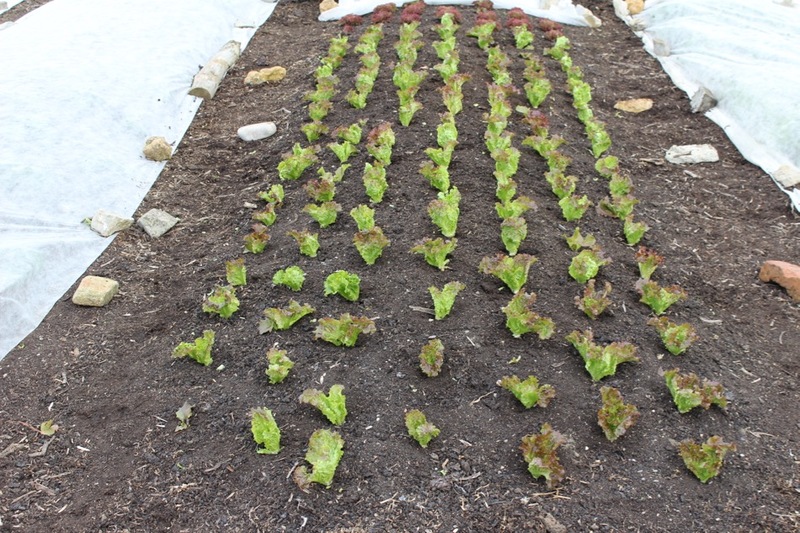 I officially harvested my salad bed yesterday too! 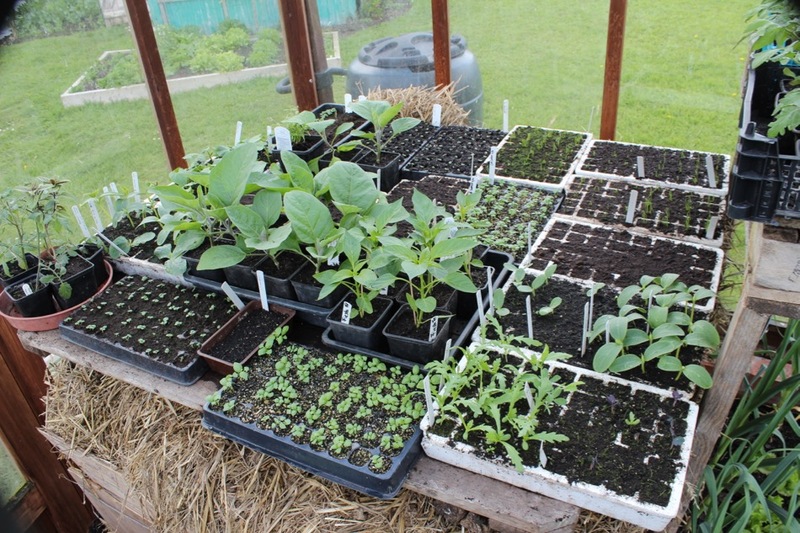 148 plants sowed on 12 Feb, planted out on 28-29 March and 5 Apr. 1.7kg worth! They were in a more shady spot and fleeced over too. We are happy with it! Although I must say looking at your pictures, Felix and Steph left more leaves on the plant. I think I was quite ruthless with the picking. I possibly only left 1 or 2 outer leaves. Is that too brutal? Yes Karen that sounds a bit too hard for picking, esp. at this time of year. We leave more leaves in cooler conditions and on young plants, and depending how soon we need to repick, each time is a little different. Well done on your result and that bed will now serve you well for many weeks. ooooops! oh dear! I hope they will recover ok. I will give them more time to make more leaves and not harvest for a while. I”ve just been out and collected two Green Waste Bags full of twigs, leaves and surface mulch from a wood; four GWBs of horse manure, including quite a bit of straw but also some wood shavings; collected a carful of cardboard from the Garden Centre and tomorrow when the serviced lawn mower is finally switched on, the grass will be there to try and emulate your heap making! I’ve even located a fine area of nettles, although I’ll have to use secateurs as I don’t have a scythe. Rock dust is to hand, as are some comfrey leaves. Whether all that lot will add up to a full cubic metre, who knows, but I guess i can go out again tomorrow and collect a second lot of ingredients if it’s only half a heap by lunchtime. Great job Rhys, a sterling effort that man! Let us know how yours goes. Me….well I’ll be at work..grr. 1. 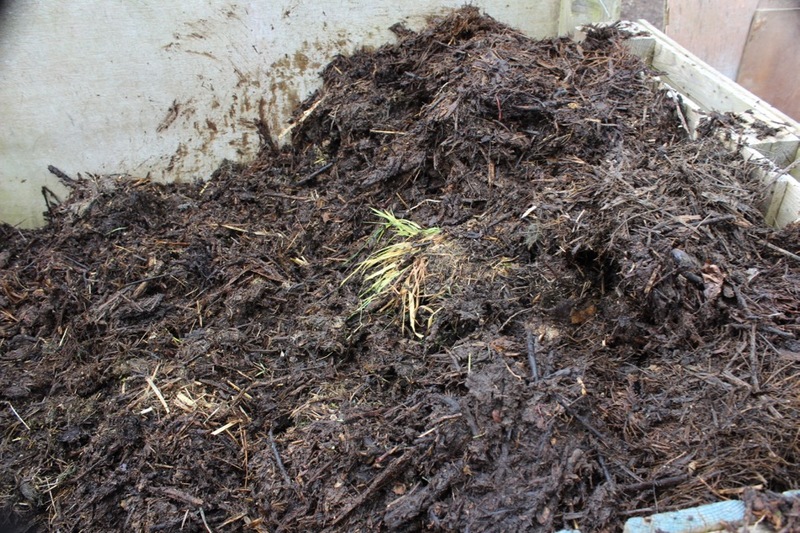 8 half-filled Council Green Waste bags (CGWBs) of horse manure/straw = 4 completely filled ones (too heavy usually to prevent the handles breaking off them, so two journeys to the stables). 2. 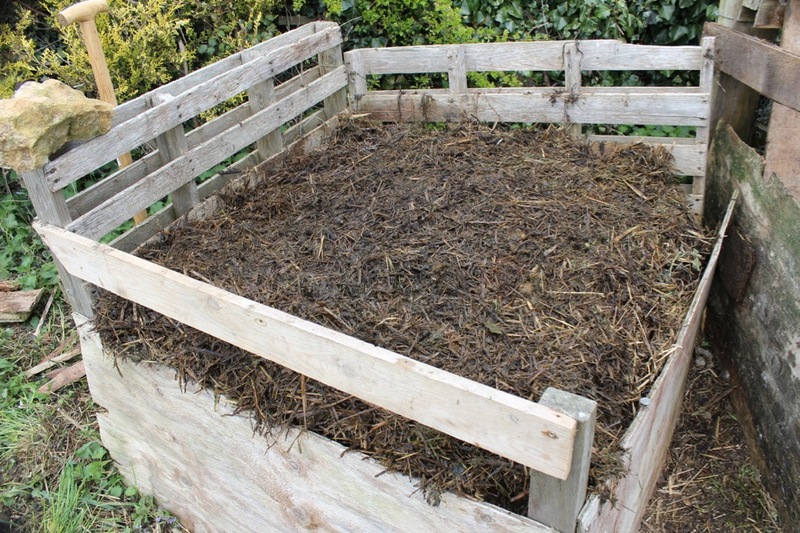 Two fully filled CGWBs of wood surface mulch (twigs, leaves and a bit of the rich soil underneath), mixed in with one fully filled CGWB of grass cuttings, mixed together in a wheelbarrow prior to adding to the heap. 3. Two large comfrey plants cut back to act as an activator, along with however much Rock Dust you feel like/can afford to add. I am sure you could add a lot more comfrey, but that was what I had ready this late spring of ours. 4. One small car load of cardboard (about four reasonable sized boxes flattened) – one torn-up box per brown layer giving four thin layers of cardboard through the heap. I didn’t add any nettles, which I am sure is a great activator too. I also added about 12 two gallon watering cans of water to wet the heap – with the hot weather coming I am wondering whether I will need to add some more. I de-fleeced all my beds today and had an inspection of what was underneath. Here are a few observations from NW London. 1. 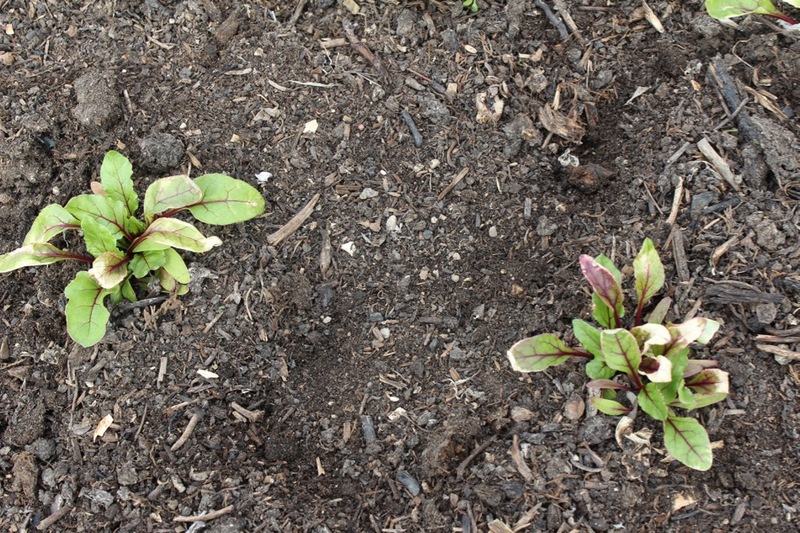 Beetroots germinate in the soil in early April, but the cold has left plenty of leaves still purple. There are plenty of signs of green emerging, so hopefully all will grow away well in the warmth to come. 2. If anything, Kelsae onions do no better under the fleece than outside it. I actually had 5 onions not under cover as my fleeces are wide enough this year and they appeared to be doing if anything better than the 30 underneath. 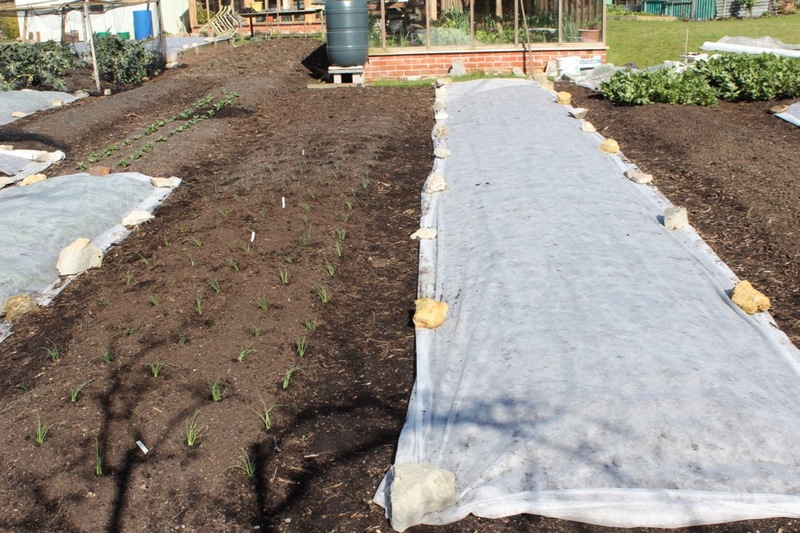 However, the shallot seedlings I put under fleece have done well and the Sturon onions in modules which weren’t put immediately under fleece succumbed. I put down 12 compost ‘cow pats’ with seeds inside at the April full moon to replace the lost ones and they are all coming through together as of yesterday after being under fleece for 2 weeks. 3. 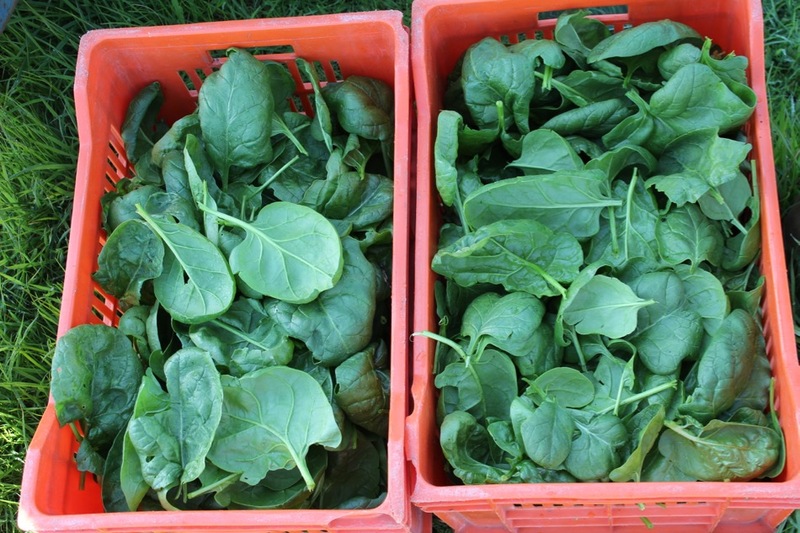 Lettuce, spinach and radish benefit hugely from being under fleece – the growth rates, quality of harvest and first date of harvest are transformed by being under fleece. Radish will also germinate beautifully under fleece producing the finest April roots I’ve yet grown. 4. Carrots germinated poorly under fleece at the March full moon, but appear to be coming through well now after sowing at the April full moon. As the seeds were from different companies, difficult to say for sure if it was the seeds, but I do wonder. 5. Peas grow on very rapidly after transplanting when put under fleece. I now have a full row of healthy, rapidly developing plants. 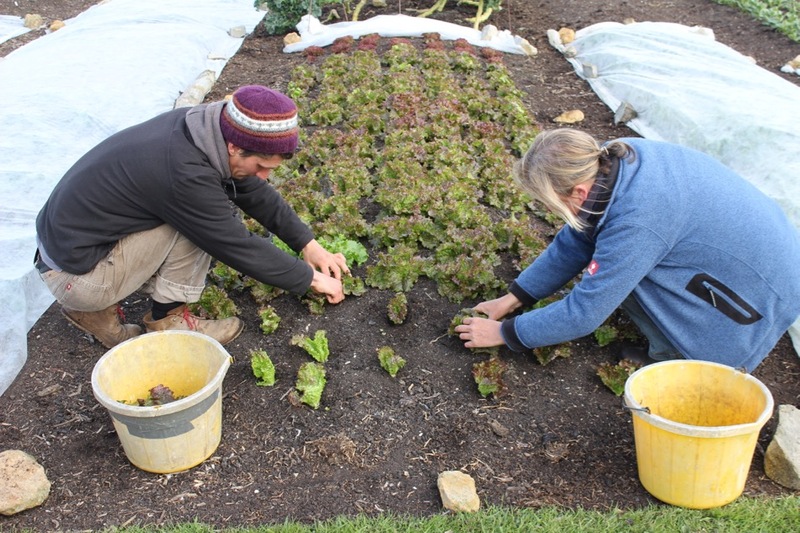 Given these experiences, I was asking myself this afternoon whether over-wintered chard for spring harvest would benefit from fleece over the winter, as there tend to be losses of plants left open to the elements. 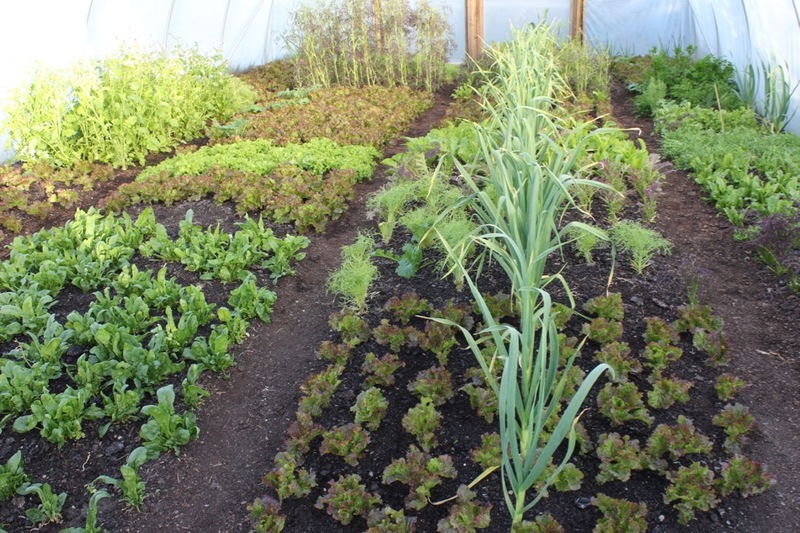 Garlics and Broad Beans do not appear to suffer from the winter elements, but I wonder if protection from the wind would also help them through being under fleece over the winter? Rhys, thanks for all of this, some interesting observations. For future use, would you guesstimate a full CGWB to be approximately the same volume of materials as a heaped barrow load? I liked the addition of some woodland mulch, should be plenty of soil life in there? I think so, although obviously it depends on the size of your wheelbarrow! It would certainly fill my wheelbarrow, but maybe it wouldn’t be that heaped?? 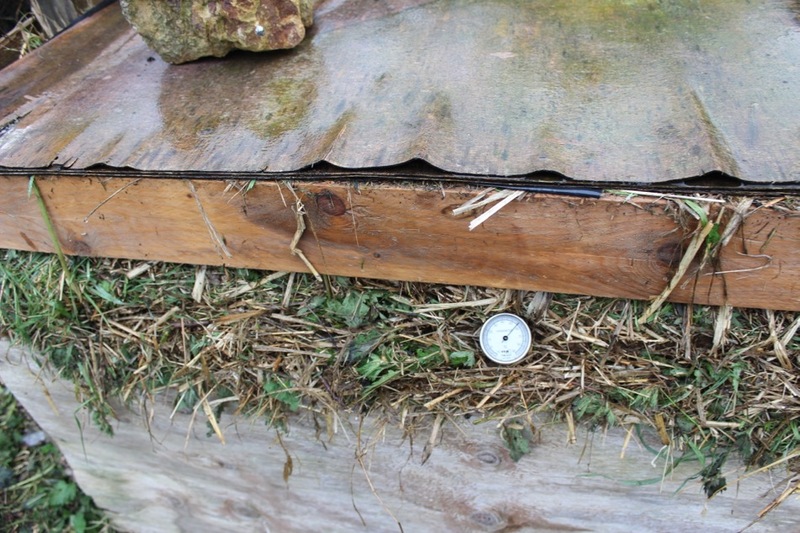 I think I might use more grass too in a future heap – the grass alone in a CGWB reaches nearly 60C within 24hrs of cutting, whereas the heap I made isn’t yet over 40C although it’s considerably warmer than air temperature. I’ve had issues in the past of the grass congealing within the heap, so I tried a bit less. These things are always a bit trial and error……. Temperature as of 9.30am 8th May in the middle of the heap is 53C, so it’s not a fully fledged bacterial heap, but it’s nice and warm in the middle. Heap seems to have stabilised at 60C the past two days….. I bought a lot of fleece of the heavier grade from Harrod Horticultural a while ago but I have not been impressed with the quality. It will barely last a season before disintegrating into small pieces and blowing round the garden. Yesterday I saw a jackdaw flying off with some for nesting material. This preamble is leading up to me asking for any recommendations for suppliers of good quality well priced fleece. Andy, that sounds bad and should not happen, I would ask for a refund or different product. There are occasionally batches where the UV treatment has not worked, so the fleece breaks up quickly in sunlight. 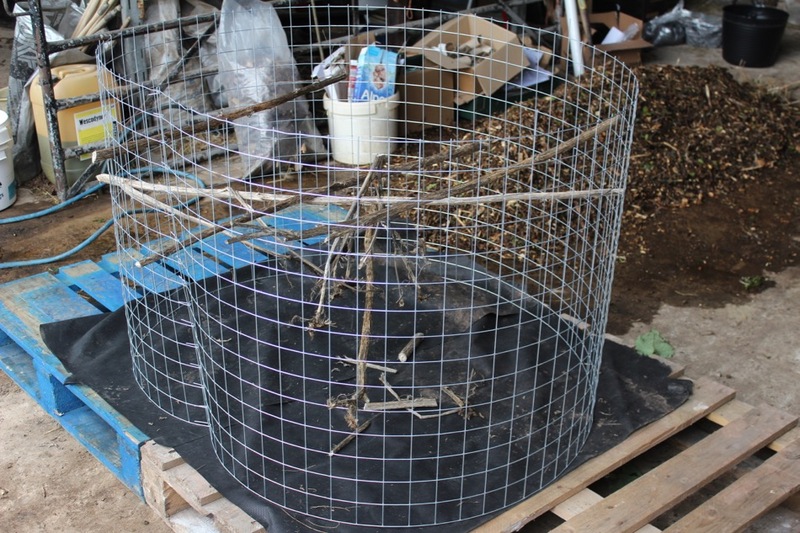 Check this link http://www.lbsbuyersguide.co.uk/netting-fabrics/fleece/white-fleece.html to see a different supplier, or you could perhaps try this one http://www.lbsbuyersguide.co.uk/netting-fabrics/fleece/hi-grow-thermal-crop-netting.html which claims better light transmission (85%) and more strength, but for a higher price. LBS require registration if you want to buy from them.